The Royal International Air Tattoo 2016, which was held at RAF Fairford over the weekend of 8th-10th July, was a highly successful event for us. We met many interesting people and potential volunteers, gained many new supporters on the stand, raised a substantial amount in donations and made some very important contacts for the future of the project. During the event we gave several media interviews. 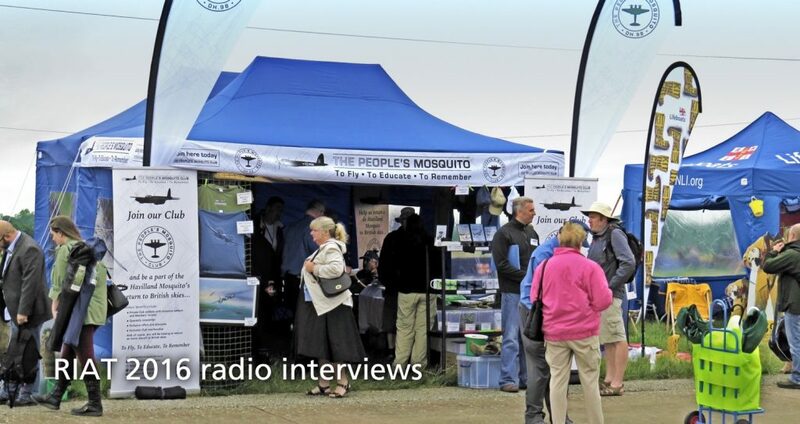 John Lilley, Chairman and MD, and Bill Ramsey, Operations Director were interviewed for the RIAT radio station Air Tattoo Live 87.7FM by Richard Wyeth and Josette Lesser respectively. These interviews were aired during the show and proved a great help in drawing people to our stand to find out more about the project. Thanks for listening, and hope to see you at RIAT17. Thanks to Air Tattoo Live 87.7FM and Yaketyak Productions for allowing us to share these interviews. With special thanks to Donna Liggins for opening doors and pulling some strings.